The Governor of Bayelsa state, Seriake Dickson, on Tuesday, described the six years administration of Goodluck Jonathan as a wasted opportunity for the Ijaws. 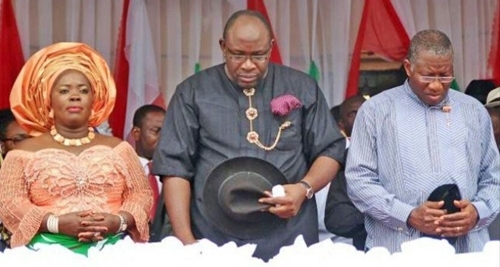 While speaking at the Ijaw House in Yenagoa in a gathering of Ijaw leaders and youths on Tuesday, the Governor of Bayelsa State, Seriake Dickson, regretted the six years administration of ex-President Goodluck Jonathan, describing the period as a wasted opportunity for the Ijaws. According to The Nation, Dickson who spoke at the gathering of the annual celebration of Bayelsa hero, Major Adaka Boroh, who fought and died for the Ijaw struggle for self determination, said ministers and other presidential aides from Bayelsa were after selfish interests, thus losing the unique opportunity of attracting development to their domains. Speaking before laying wreaths at the tomb of Boroh in the Heroes’ Park, Dickson who led his deputy, Rear Admiral John Jonah (retd) and members of his cabinet to the event, recalled that the persons who served in the Presidency for six years failed to work with him in the quest to bring development to the state. Instead, he said they were preoccupied with “devilish plot” of unseating him and installing another governor in his stead. “They suffered from the Bayelsa-Ijaw disease of pulling-him-down syndrome,” Dickson said. He added: “It is true that we are celebrating Boroh, but ask yourself whether you are doing your bit. Boroh came, saw and did his bit and has gone. I and my team have come and we have taken up the battle from where Boroh stopped and we are doing our duties. Also at the event were former Military Administrator of old Rivers State and King of Twon Brass, Alfred Diette-Spiff; wife, daughter, other family members of the late Boroh and some traditional rulers. For the first time in many years, the two leading Ijaw groups, the Ijaw National Congress (INC) and the Ijaw Youth Council (IYC) played no role at the event because of leadership crisis ravaging them.